Walking along Orosa Street, with a paper cup of commercial hot chocolate on my left hand, a cheap, black umbrella on my left, and a dangling bag full of review materials, I desperately wanted to sleep. The exam was a beating, and everyone, perhaps even the best of us, felt exhausted, one way or the other. What lessons on humility, dependence, and trust in the Lord I have been learning for the past few weeks. People have come up to me and said they stumbled upon my blog. Thanks for dropping by! Please feel free to browse around. I assure you, though, there's not much of a blackmailing material here. I get teary-eyed studying the anatomy of the human body. In my mind, "Lord, what an intricate, marvelous body you've given us." I am just amazed. A classmate and I are walking back home. Dalvie, a smart guy four three years younger than me, says, "Alam mo, Lance, may kakaibang amoy kayo." "Talaga? Ano'ng amoy?" I ask. At the back of my mind, I already know, but it's different hearing words come out from other people. "Parang nabubulok. Kayo nila Jegar at Marv." Instead of being offended, I was so pleased I would have offered to embrace him with my oily, smelly arms. She had thick skin, dark and burnt-looking in certain areas, brown in most of her arms. We just met our cadaver. Ours was the biggest and fattest among them, and therefore, the hardest to dissect. I suppose all medical students have to go through the ritual of cutting up a dead body open, with the hope of gaining information from that person's muscles, nerves, and bones. After all, the cadaver is the first patient. The things we have to do can get a bit overwhelming. There's time pressure: we have to finish everything before 5 pm. There's mental pressure: we have to know and understand what structures we're looking at. There's peer pressure: the other groups are done, and we're not yet halfway. But I'm glad I belong to a great group. There are six of us. Ching is calm and methodical. Marvin is strong-willed and unflinching. Jegar is generous and helpful. Bagani is cautious and reserved. And Lennie is focused and relaxed. We spent the afternoon skinning the upper half of the body. While the other groups had it tough, we had it tougher. We had to navigate our scalpels through fat tissues an inch thick while keeping the muscles beneath them intact. To skin the back, we had to turn the cadaver over—ours was humongous. The fat tissues weren't much help, either. We had to change gloves more than thrice because they were dripping wet from the oil. I don't know how to put these in words, but if there is one event that sealed my being a medical student, it is this. Dr. Bundoc calls it “baptism by fire.” You'll never come out of the cadaver room the same man again. In the thick of things, though, my friends and I forgot one thing. The name. We haven't given her a name yet. Is Big Bertha a good one? I'm sorry I haven't posted the weekly diptychs. Medicine gets the better of me these days. But I'll try. I should've known better: I live in Manila now. And when it rains, chances are, the streets are going to be so flooded blue whales can swim in the water. Imagine my shock when, on a free Friday afternoon (free because classes were cancelled, thankfully), I settled business with the internet provider at UN Avenue, a 20-minute jeepney ride from where I stay. The irresponsible bloke that I was, I headed to the streets with no umbrella, hailed a cab, and waited for about half an hour in mid-traffic, watching cars detouring because this or that street was in deep water. Literally. On my way home, I decided to take a jeepney that ran along Taft Avenue—yes, that dirty, third-worldish, claustrophobic highway where time seems to stand still because, more often that not, you'll reach your destination faster when walking than when riding a vehicle juxtaposed between two humongous buses. The ride seemed to go on forever that I had nothing else to do but to stare at the other passengers' skin lesions and describe them in my mind—an erythematous papule on the man's left cheek, an atrophied scar on his elbow, and I won't continue this medical nonsense because I'd sound geekier than normal. At one point, as the jeep traversed Padre Faura and Pedro Gil Streets, I asked myself how I was going to alight. Was there going to be the same degree of flooding in the next streets? The water outside was murky, clearly infested with microbes that could potentially harm my well-being, and the thought of soaking sneakers was just unbearable. Now I know how people in Waterworld felt like—an approximation, at least. But the water level subsided at Nakpil where I got down, so that was something to be thankful for. I guess I have to get used to these things. After all, I live in Manila now. Today has been a long one. Three exams in a row. Lunch with med dudes. A Bible study meeting after class. Dinner after. Another late dinner with old Koronadal friends after that. My idea of detoxification—a term people use here to denote a certain form of leisurely activity that should take their minds off medicine—is to eat a hearty meal, sleep, and have some quality time alone. I've done some of these myself. I'm thankful for God for helping me get past this day. I've had the chance to listen to His Word and engage in edifying conversations with classmates who are seeking Him. Katrina, Ronald, and Jet also came over to have dinner. The last time I saw Ronald was in high school, and he looks mature now—a far cry from how he looked like when we rode the same sundo. Katrina is reviewing for the boards, and I'm excited for her career. She'll make it big out there. Just the reminder I need. All these were taken by Gino Gomez, our selfless class photographer. It's a shame, really, that someone who takes the great pictures can't be seen in them. Right after the first neuro exam. 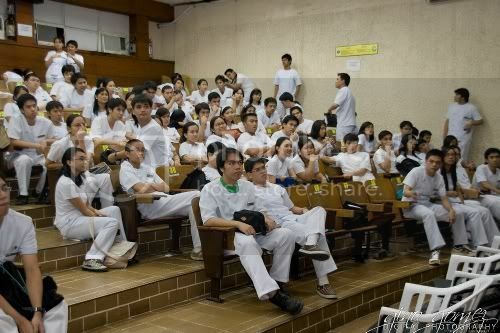 How the class typically looks like after the lecturer finishes. Our seating arrangement is permanent. I sit near the aisle, second row, quite a strategic spot, but one that's unfit for sleep. The thing with medicine is this—everything is crammed. You practically finish a book's worth of information into a week-long lecture, and there are exams weekly. I'm glad my class—Labing-apat, walang katapat!—has a way of making things easier to handle. A group of four people are assigned to take down notes for a given lecture, encode these in a template sheet, and reproduce them for the 160 of us. Because of time pressure, most of us refer to these transcriptions (or trans, as we lovingly call them) to study, only referring to the books for the topics we don't quite grasp yet. I'm also thankful for classmates who've gladly explained anatomy to me. I had a hard time with it, and I felt, at one point, that I was the dumbest in class. But God provided friends who've painstakingly answered my questions, explaining to me which artery goes where—among others. 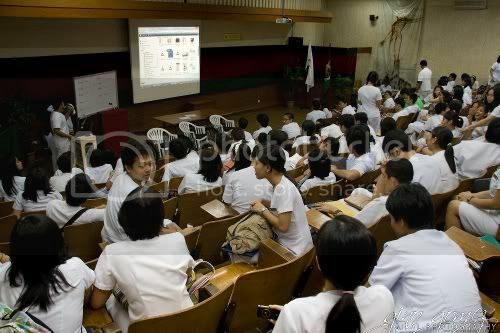 Yesterday marked the first day of wearing white uniforms, as well as our first major exam. It was a surreal experience, walking around with the outfit (and I really hope someone posts those class pictures soon). 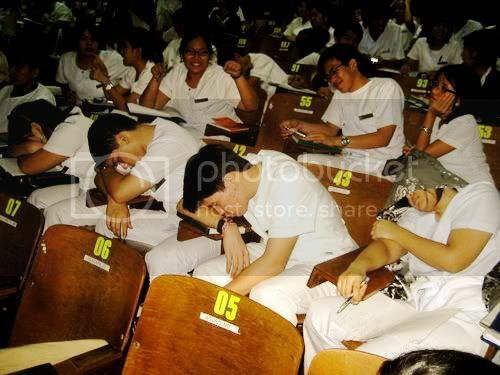 I was exhausted after the neuro exam, partly because I hardly slept the night before. But then again, so did all of us. So, how was it? It was, to put it mildly, a beating. But it was a joy to have finished my first major long exam in med. If I should pass it, it will be because of the overwhelming grace of the Lord, who is the "strength of my heart and my portion forever" (Psalm 73:26). 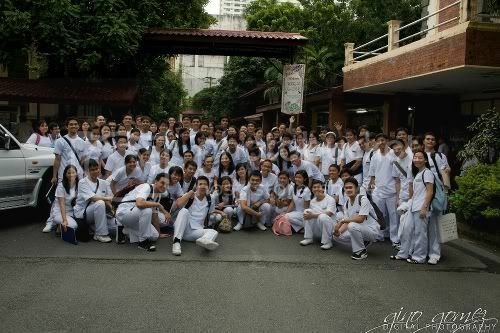 We've barely touched the tip of the iceberg that is med school, but we're all thrilled to see what's next. I'm relieved to know I'm not the only one. When I installed the latest Ubuntu version on my Compaq Presario CQ40, I later found out that my sound card wasn't recognized—in which case I had a silent laptop. Ironic, when you think of it, because the owner­ can get unbelievably noisy. Naturally I searched the forums, and it was a comfort to know that I wasn't the only one suffering from acute laptop speaker deafness. Misery loves company, they say. Apparently, I had to do some configurations. The kind people in the forums have posted numerous tips, but some of them were rather too technical for me. So imagine the thrill I felt when I learned about this tutorial. It didn't work at first because I forgot a fundamental rule: after tweaking the computer and finding out nothing works yet, a restart may do wonders. And restart I did, and, for the first time, I'm hearing my laptop speak. I knew this couldn't have been genetic. A day of firsts: wearing scrubs and handling a preserved brain. Everyone was giddy, taking pictures here and there. As for me, I'm barely hanging when it comes to anatomy. The brain is one huge wonderland. The Lord just amazes me—for making a complex brain, and then giving it to us. That you can only read and study so much because there are just so many materials and new knowledge to process.